For the vast majority of South Africans, this country meets all their wine-drinking needs. And why not, indeed, when what you’re wanting is a modest range of styles, generally offering good or very good value? Why bother with paying for the import costs of foreign wines, whose unfamiliar labels anyway require deciphering and even translation? And the much-increased quality of local wines makes it ever more plausible for even discerning wine lovers to stay at home. Only a tiny number of winos want more than what is offered by the local product, want to experiment and delight in styles and characters produced by other summers and hillsides and grape varieties. Reliable hard statistics about imports are not easily found. True, the excellent annual SAWIS booklet of stats does give some figures, but they vary so wildly from year to year that one is left scratching one’s head. Industry personality Michael Fridjhon believes that the import figures might also not truly reflect domestic consumption, as some of the imports might be (surreptitiously) re-exported. Anyway, what SAWIS says is as follows (excluding bulk imports, which are mostly white, coming in as concentrate or as sweetening must). In 2015, imports of all categories of foreign wine (half of it sparkling) amounted to 1.1 million litres. Local sales of domestic wine amounted to over 425 million litres. About 0.25% of wine drunk in South Africa is foreign, then, going by those statistics. And don’t think of all that as grand Bordeaux and burgundy – a significant proportion would be the likes of Casal Garcia vinho Verde from Portugal. So, a tiny proportion of wine drunk here is foreign – probably amongst the lowest in the world. I also looked for some statistics in that splendid free boon to wine-stats junkies: Global wine markets: A statistical compendium, by Kym Anderson, Signe Nelgen and Vicente Pinilla, the latest, expanded edition covering 1860–2016, available as a PDF download here. Here I could compare South Africa with some other New World wine producing countries. However, the reliability of mere statistics is immediately revealed by the Compendium giving South Africa’s imports in 2015 (and 2016) as rounded to 3 million litres (versus SAWIS’s 1.1 million; presumably both works exclude the 15 million litres or so of white bulk concentrate/sweetener). Anyway, here, comparing South Africa’s 3 million litres of imported wine in 2016: Chile is exactly the same; Argentina is 11 million; New Zealand is 37 million, and Australia, together with New Zealand by far the richest of these countries, of course, 87 million litres. What is interesting about the South African statistics, though, is that the value, as opposed to volume, of imports is unusually high: US$28 million, versus Chile’s US$9 million for approximately the same volume. All this, dear glazed-eyed reader, as a prelude to reporting on three imported wines I tasted as part of my sampling quest to find good value/high-quality wines under R100. These ones cost R90 each from Checkers, which is surely the merchant showing the greatest commitment to offering the public lower-priced imported wines (Michael Fridjhon plays an important part in their selection). Firstly, all three are brands sold widely around the world and (going by wine-searcher.com) the rand price is substantially lower than elsewhere. Congratulations to Checkers for that alone! But would we choose to drink them? 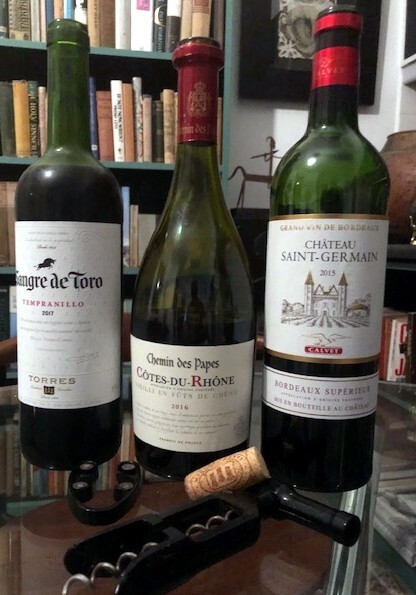 I was hoping most for the Bordeaux, Château Saint-Germain 2015 – a good year and Bordeaux can offer some of the greatest wine value anywhere at its more modest end. This example from the Bordeaux Supérieure appellation is well structured, pretty decent overall, but less elegant and riper and extracted than I’d hoped for. It did benefit from being open a day. Decent value at this price, but not really a Bordeaux experience. Sangre de Toro is a huge brand from Spanish mega-producer Torres. This 2017 Tempranillo comes from the hot inland area of La Mancha. Ripe, pure fruit, untrammelled by oak, decently built. Good, but not really distinctive enough, I’d say, to compel; we have enough typically warm-country reds here. But also pretty reasonable value. I had least hopes for the Chemin des Papes Côtes-du-Rhône 2016, presumably from grenache and syrah, with a plastic cork and declaring 14.5% alcohol (the other two were 13.5%). We can do that here better for the price, I thought. But in fact, I was won over by this wine more than the others. Generous but very well balanced, benefitting from some time in older oak, spicy and quite complex rather than merely fruity, with a good dry finish. Certainly excellent value as a Côtes-du-Rhône: the otherwise least expensive of them available here are Chapoutier Belle Rouge and Guigal, also big brands, and they are more than twice the price of this, and I don’t think you’ll get more from them. Or from local syrah blends under R100, frankly. That delicious wine I shall probably buy a few more bottles of for myself for shortish-term drinking (that plastic cork!). And, on the strength of this limited experiment with three bottles, I shall also continue to explore with eager anticipation the foreign stuff that Checkers has on offer. If anyone out there has particular recommendations, I’d be grateful. Very insightfull article as always with Tim. I am still surprised by the volume of wine import reported as my perception of the trade and the consumption would put this at a much lower figure. Does this include import of French Champagne as this would explain a lot? I read not too long ago that French Champagne SA import stands at around 650000 bottles and growing fast. Tim, I personally think the Anekena Sauv Blanc from Chile offers great pleasure relative to price (R45.00 a bottle!). I also had a great bottle of Sangiovese from Checkers the other day at R150 but neglected to take note of the producer. The Vinho Verde White at checkers is 100% drinkable. I sse they have a rosé as, well now buy haven’t tried it. Absolutely agree, Mo – it’s great value for money! I havé been enjoying Torres wines over a wide range of prices for at least 45 years. I like thé fact that they are différent to thé South African wines we usually enjoy. Thére are usually three or four àt Checkers.